The π series induction boiler is the best solution for those who build their houses in the zero-energy (A++), passive (A+), low-emission (A), energy-saving (B) and medium energy-saving (C) technology. Buildings constructed in these technologies, or properly adapted by means of thermo-modernisation, are characterised by low energy demand factor. In that connection, heating the home with the π series induction boiler is a revolutionary solution in the modern building heating technology. Combining the boiler with a buffer tank and choosing the night tariff (G12) of your energy supplier – the costs of central heating can be reduced to a very low level, making this boiler a serious alternative to other common heating solutions. It is possible due to the use of electromagnetic induction. It allows the boiler to heat water very quickly. The diagram below presents that dependence. The π series induction boilers transfer the heat power almost rapidly. High inertia allows to reach the rated power quickly. In A++, A+ and A class buildings, the costs of heating with the π series induction boiler are lower than heating with coal (G12 tariff). 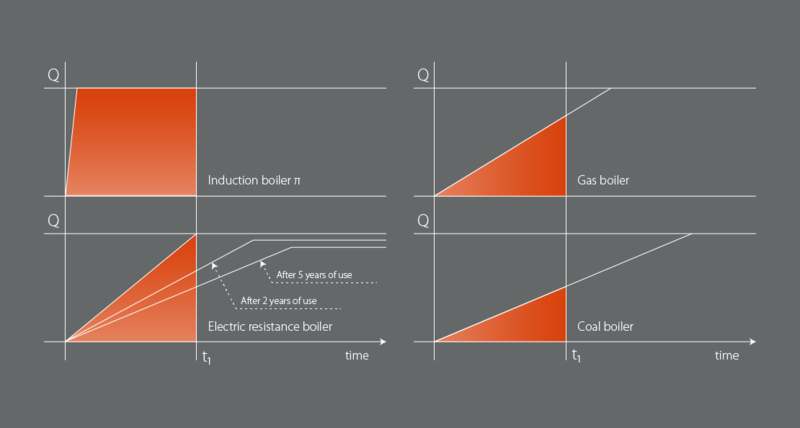 In B, C and D class buildings, the costs of heating with the π series induction boiler are lower or comparable with the costs of earth gas (G12 tariff). Start up time of typical boilers is much longer. Another very important feature that determines the reduction of operating costs of the π series induction boiler is the heating chamber made of stainless steel with high durability, which allowed us to reach very low thermal load of the heat exchanger. Due to the use of innovative solutions in the boiler design, all thermal energy is generated in the heating chamber. It allowed significant reduction of the electromagnetic field loss, which is reflected in lower costs of everyday operation. Maintenance free – comfort, time, savings! The π series induction boiler is maintenance free. The controller settings only include buffer tank set temperature sustain and boiler switching time to heat up the water in the tank. The boiler turns on automatically (without any noise or vibration) during the hours of the cheaper power supply tariff. When water reaches the set temperature, the device turns off and estimates the time until the next activation. There is no need to supervise the boiler operation, check its parameters, make any additional adjustments, etc. The boiler design ensures maintaining the set temperature both in the central heating system and the domestic hot water system. Additionally, the controller allows selection of boiler control program according to the needs and the comfort of use. It allows setting boiler switch on and off priority at a precisely defined time on a given day of the week. The estimated service life of the π series induction boiler is approximately 50 years. Its solutions and subassemblies are provided by verified suppliers (no parts of the boiler are made in China). The heart of the boiler – stainless steel heat exchanger, installed within the transformer designed, tested and manufactured exclusively for this particular device – guarantees many years of reliable operation. Additionally, boiler parameters will not change during the entire service life. Effectiveness (almost 99%), efficiency, operation time, water heating rate will be the same even after 40 years. The π series induction boiler has a limited space requirement. Its compact dimensions, vibration-free and noiseless operation allow to install it practically anywhere you need. The user does not have to prepare space for fuel storage, build chimneys conforming to the standards (as it is required for solid fuel boilers) or care for tidiness and dust removal from the boiler room. Installation of the boiler electric system is very simple, it is enough to connect it to the 3-phase power supply using a proper set of residual current protective devices (available soon in our portfolio). The hydraulic system is not much different than standard systems provided for other heating devices – with the π series boilers it is even simpler and cheaper in installation. For an average house, a buffer tank with the capacity of 700-800 litres is sufficient. It can be installed in any, even a very small boiler room. It is also worth mentioning that the installation and operation of induction boiler does not require radiators replacement, which is necessary for any other electric heating system. It can work with steel, copper and aluminium radiators. The boiler is environmentally-friendly. Since no exhaust gases, waste or oxides are produced, there is no need to install any additional heating system safety devices. Free heating? – it’s possible! The use of photovoltaic panels may fully or partly compensate the cost of electric energy. Since photovoltaic panels are most effective when the energy demand is at the lowest level, it is good to accumulate energy by returning it to the power supply network. Most of that energy (80%) can be used at any time. In such case, the fitter of the photovoltaic system shall mount a two-way meter. The most cost-effective method is to install photovoltaic panels to cover high electric energy demand, e.g. for heating and/or reheating domestic hot water. The basis for the selection of photovoltaic panels is the energy demand factor of the building. In practice, it reflects the amount of energy required for the yearly use of the building. This factor balances the loss of energy escaping through external walls and ventilation, the efficiency of heating equipment, energy consumption required for heating DHW and energy gain from insolation, people present inside the house as well as the energy produced by other household equipment.